Now, that's truly food for thought..
Back to today's Avial. My family loves this loaded with veggies, therefore used 3 cups of chopped vegetables. You may increase or decrease the quantity and adjust the masala gravy accordingly. 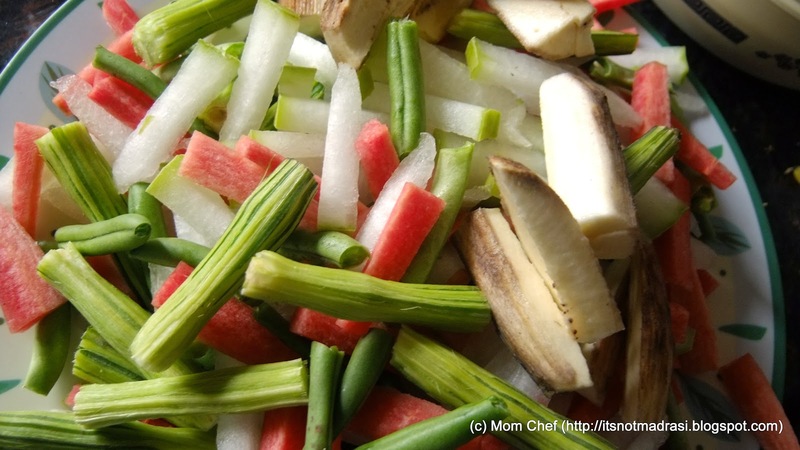 1) Wash, peel and chop all veggies and boil them in water with a pinch of salt till 85% done. Drain and rest. 2) Grind all the masala ingredients into a smooth paste . 3) Beat curd well and add the masala paste and make into a smooth flowing gravy. 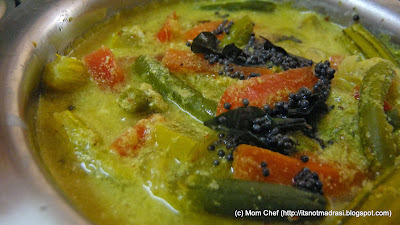 4) in a skillet, make the tempering, add the veggies, salt and add the masala curd paste. Simmer on a slow flame for about 3 - 4 mins, not more. 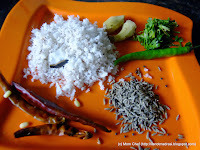 5) Serve hot with steamed rice and roasted papad. If the gravy turns too watery, mix some 2 tsp of rice flour in 1 tbsp of water, and add this to the gravy. In fact, many households grind 1 tbsp of soaked rice in the masala paste itself, thereby adding an invisible thickening agent. If the curd is not sour enough, and you need some tang, add 1/4 lemon sized tamarind to the masala paste. 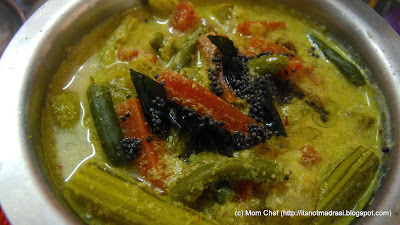 Make sure you drain the water from the boiled veggies, else you will end up with a very watery gravy which will dilute the masala and the curd mixture will lose its texture.